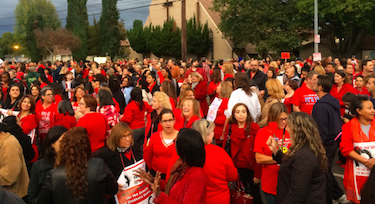 UTLA rally at James Monroe High School in November 2014. Members of the LA teachers union, UTLA, will be out in the streets Thursday as part of a “Day of Action” that is planned in conjunction with 200 other cities. Union members will be visiting homes in the areas near LA Unified schools for planned “neighborhood walks” where they will ask residents what they want to see in their schools and express support for Propositions 55 and 58, two measures on the November ballot. UTLA President Alex Caputo-Pearl mentioned the day of action as part of his state of the union speech in July and said the event will be in coordination with the Alliance to Reclaim Our Schools, a national group of parent, youth and community organizations and labor groups whose stated goal is “fighting for educational justice and equity in access to school resources and opportunities.” UTLA participated in several Alliance national events last school year, including “walk-ins” in February and May. According to UTLA’s newspaper, as of Sept. 16, at least 140 schools have signed up to participate in the day of action. The event will begin at 3:30 p.m. after school is out, with parents, students, teachers and community supporters meeting outside schools for a brief training session on the “nuts and bolts of going door-to-door,” according to a UTLA flyer on the event. From 4 to 5 participants will walk in pairs and visit homes in the area then meet back at the schools from 5 to 5:30 for a debrief. Prop. 55 is an extension of taxes on high-income earners. Prop. 58 would allow public schools to decide how to teach English language learners, removing restrictions from a referendum passed 18 years ago that required students be taught almost exclusively in English. “At stake is whether California’s highest income earners will continue to pay a particular stream of taxes to support the state’s schools and social programs, or whether they will be given a tax break amidst growing poverty and inequality,” Caputo-Pearl said about Prop. 55 during his state of the union speech. “At stake is over $700 million annually for Los Angeles. We will be involved in massive precinct-walking and phone-banking as we build to the November election.” Caputo-Pearl did not return a message seeking comment.